The Kokrajhar Police has taken up the noble initiative to rehabilitate seven surrendered militants of the Kamatapur Liberation Organisation (KLO). The cops are helping these former rebels to open a pig farm at Chandrapara Bijulibari in Kokrajhar under Bodoland Territorial Area Districts (BTAD) in Assam. 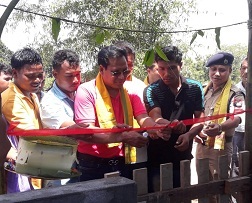 The Bodoland Territorial Council (BTC) Executive Member (EM) Rajib Kumar Brahma inaugurated the piggery farm in the presence of the Kokrajhar Superintendent of Police (SP) Rajen Singh, Additional Superintendent of Police (ASP) Taburam Pegu among others on Friday. Training was imparted to the former KLO rebels on scientific piggery farming among others. Initially, 10 pigs are being raised in the farm. Kokrajhar SP Rajen Singh said the piggery farm is a part of the State Government and the Kokrajhar Police’s joint initiatives to rehabilitate former militants who have laid down arms and have come back to the mainstream to eke out “honest means of living”. Singh said the youths were being trained on how to raise pigs. The Kokrajhar Police chief said the police administration will continue to help the surrendered militants to start their life anew and “live in the society with their heads held high through hard work and self-employment schemes”.